The protection you deserve at a price you can afford! UltraSense®EC is a patented, next generation nitrile formulation that provides a reliable barrier while offering the comfort you are used to with a latex glove. Engineered with enhanced tactile sensitivity that provides an excellent grip in both wet and dry environments. UltraSense®EC is an extended cuff offering that is packed 100 gloves per box as opposed to the standard 50, maximizing your savings. Recommended for use when: Strength and protection are of great importance. Working in environments that demand consistent grip and reliability. Precise contact requires enhanced tactile sensitivity. The glove is very soft with a latex fit. Finally, a soft nitrile Extended Cuff glove with a latex fit. 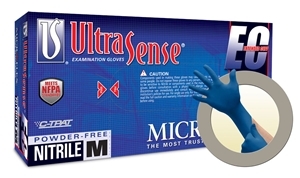 UltraSense™ EC is an extended cuff, nitrile glove with the comfort, fit, and feel of latex. UltraSense™ EC offers amazing comfort combined with extra protection over the wrist and forearm for use in high-risk environments. UltraSense™ EC forms to your hand like latex, without the associated risks, and provides reliable barrier protection against many hazardous and infectious substances. Material Nitrile, Sterility Non-Sterile, Color Custom Blue, Cuff	Extended Cuff length (12"), Glove Interior Powder-Free, Glove Exterior Textured fingers, Usage For single use only., Cleanroom Class 1,000/ISO 6, this glove meets or exceeds all current and proposed NFPA standards.